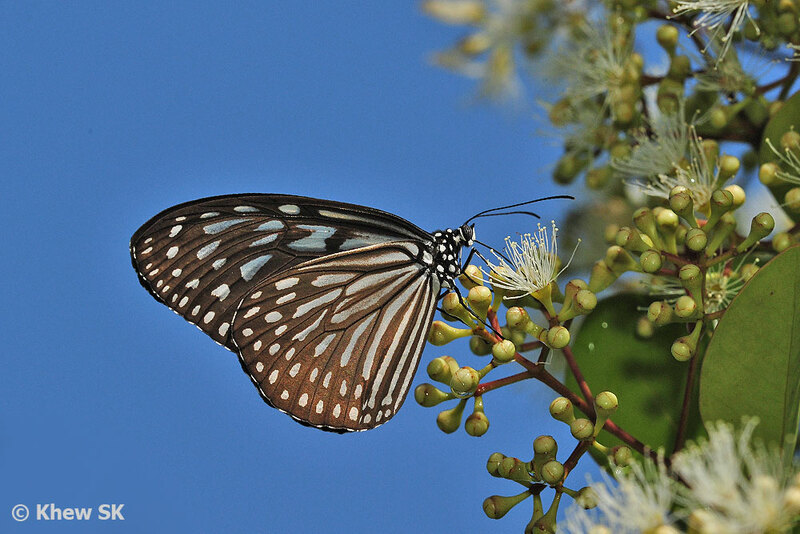 Butterflies of Singapore: Blue Skies Above! The storm has passed. Dark clouds dissipate quickly, as the sun peeks through. The blue sky reappears as the foreboding darkness gives way to rejuvenating light and the world is bright and cheery again. The sight of a pretty butterfly against a clear blue sky is often uplifting and brings delight to our hearts. The ominous darkness that brings sadness, grief, sorrow and pain to many aspects of our lives does not last forever. 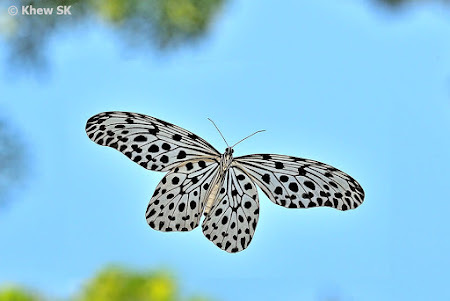 Whether at work or at home, such times of torment and trouble will come to pass, and the sunshine and blue skies will breathe healing, revival and positivity into our lives once again. 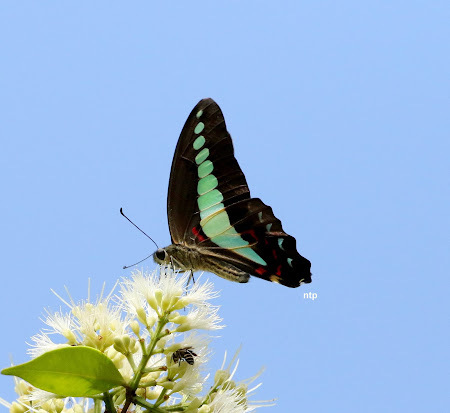 For us butterfly watchers and photographers, the sight of sunshine and a bright blue sky brings joy to our souls. 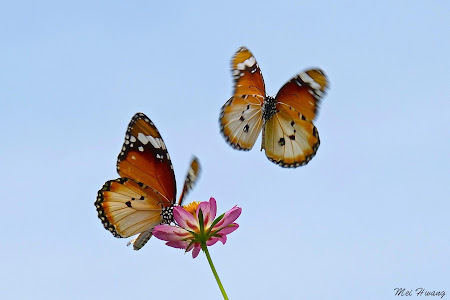 For this is the type of weather that wakes up our beloved butterflies and where we will enjoy their fluttering activity and Mother Nature's beauty and works of art. 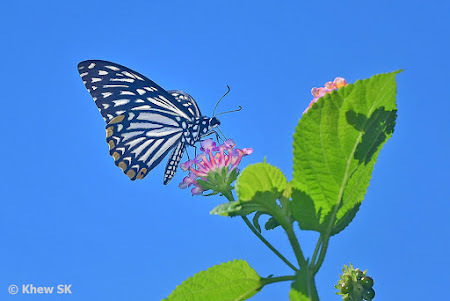 This weekends blogpost is about butterflies photographed against a blue sky - a canvas of blue that is a refreshing difference from the typical natural backgrounds and green environments that we normally see butterflies in. 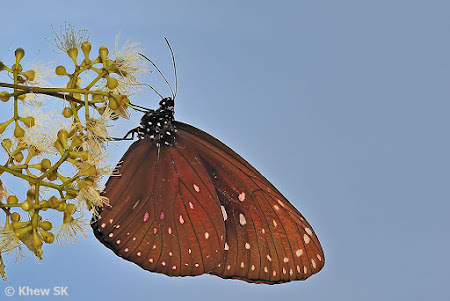 Ever so often, a tree blooms and the flowers attract a myriad of butterflies to feed on the delectable nectar within. 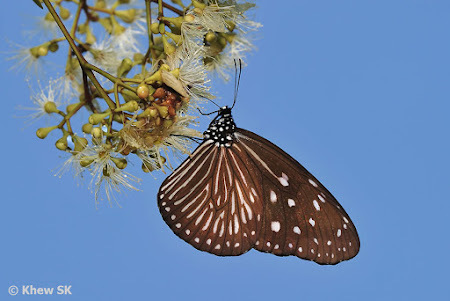 In many cases, the flowers are way above eye-level, and the feeding butterflies are isolated against a bright blue sky on a clear day. 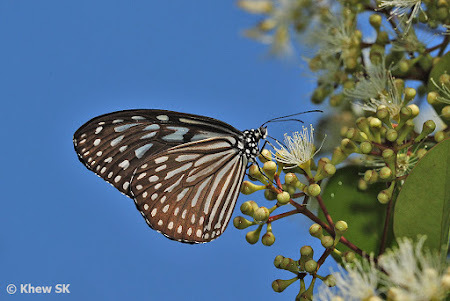 This gives an opportunity to photograph the butterfly in a unique setting against a backdrop of the blue sky. Somehow, a butterfly feeding against a blue background elicits a feeling of lightness and uplifts the spirit. 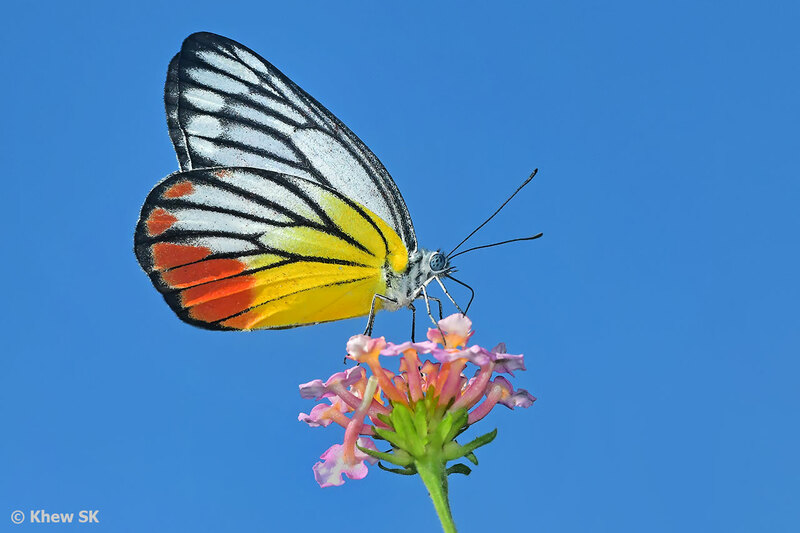 The complementary colours of a butterfly's wings against the cool blue background bring the beauty of the butterfly to life. 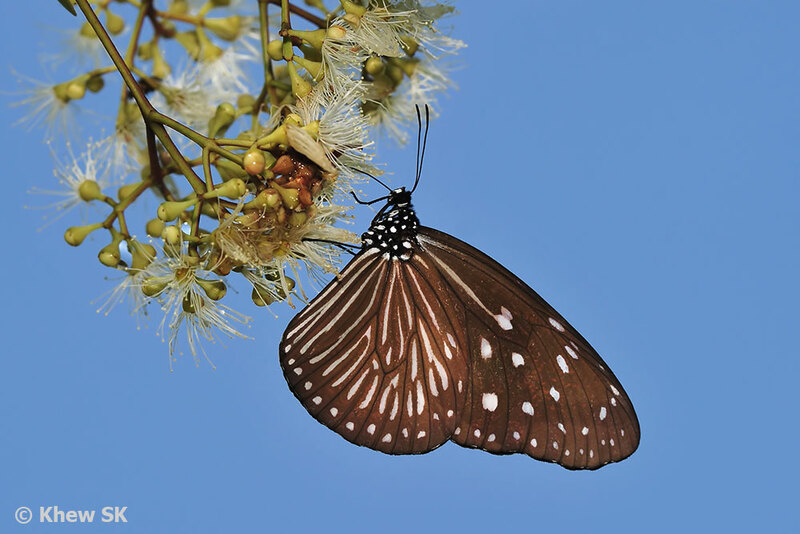 Never pass up an opportunity to photograph a butterfly against the backdrop of a clear blue sky whenever the situations arises. 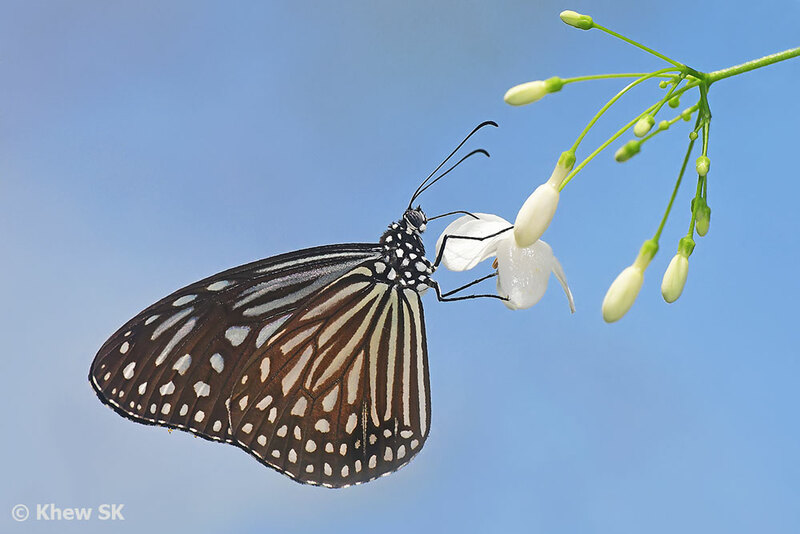 From a photographer's perspective, it is an ideal lighting situation as the brightness of the open skies usually allows you to use a low ISO that reduces 'noise' in your shots. 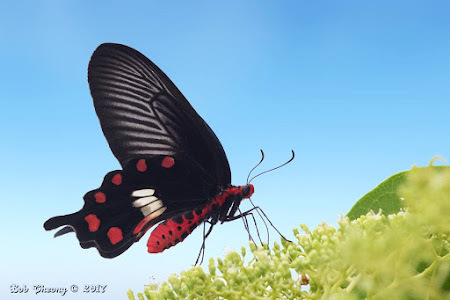 Remember that due to the bright background, your subject (the butterfly) will be in shadow if you are using a matrix (or average) metering mode. This will darken the subject and you may end up with a lack of detail on the butterfly although the background is correctly exposed. 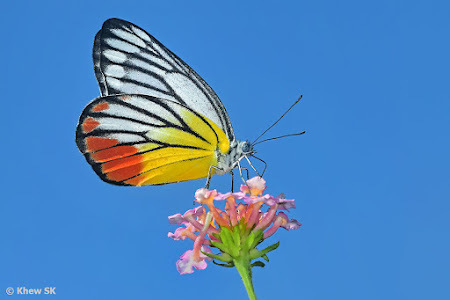 For such photography situations, a fill-flash is almost always necessary to provide illumination to the wings of the butterfly against a bright background. 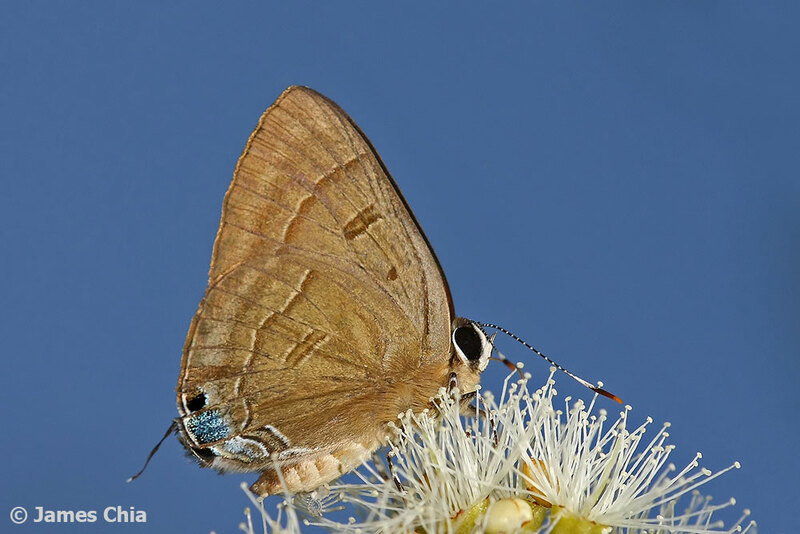 In many cases, you may have to increase the power (compensate +EV) on the flash to adequately illuminate the butterfly. 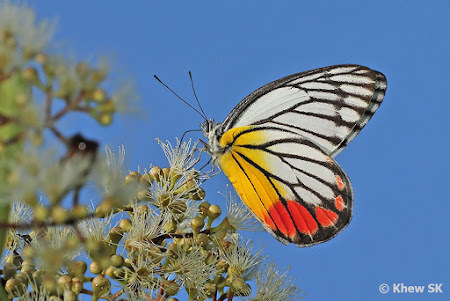 Alternatively, you may choose to use spot metering to correctly expose for the butterfly but this often ends up with an overexposed sky that is either washed out and even appear white! I find that using smaller apertures like f/10 or f/11 helps to increase the saturation of the blue sky when shooting upwards. Other than the fact that you will have good depth of field and will be able to get the subject in sharp tip-to-tip focus, the blue of the sky is also deeper and more saturated. 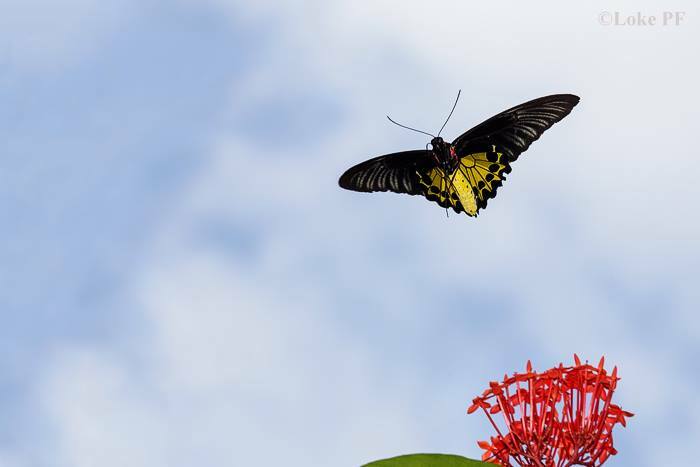 In shooting situations like this, you will not have to worry about the background being cluttered as the sky is obviously very far away from your subject butterfly. 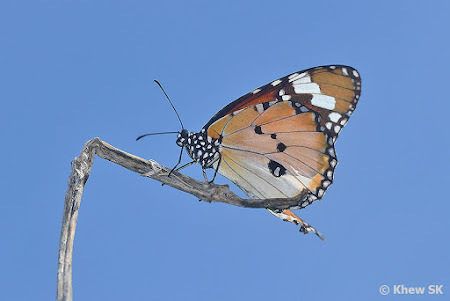 Shooting a butterfly against a clear blue sky also frequently shows up 'dust bunnies' on your camera's sensor, especially if you have not been cleaning the sensor for some time. 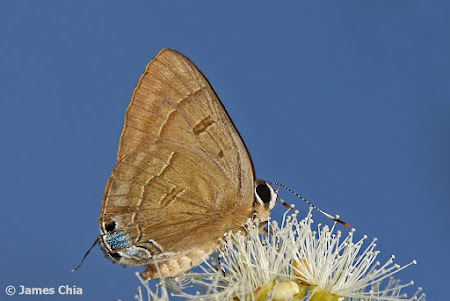 This does not pose a big problem that a little post-processing cannot solve. But it is a good reminder for your next trip to the camera servicing agent to do some sensor maintenance! 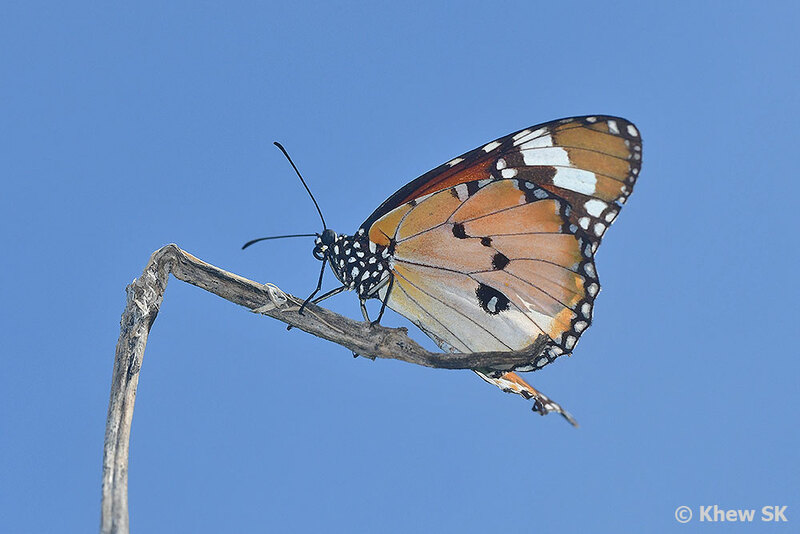 So when the opportunities present themselves when you are out in the field, look for situations where you can pose your butterfly subject against the blue sky and fire away! Let your butterfly spirit soar and enjoy the exhilaration of capturing the beauty of nature's flying jewels against a crystal clear blue backdrop. 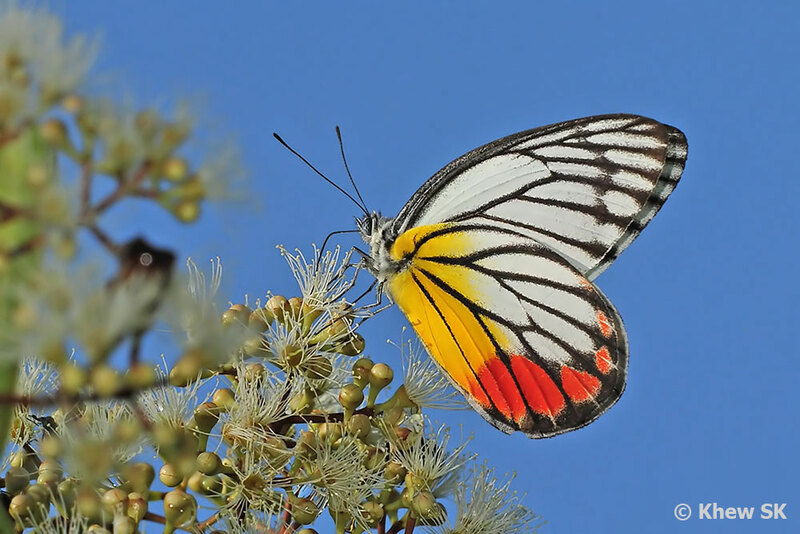 And to all our fellow butterfly watchers and photographers, may you always have sunshine, blue skies and beautiful butterflies all year round!